Every Tuesday night in our little share house family we alternate with who cooks the evening meal for all. There are basically two rules; 1. cook a ‘clean’ and healthy meal and 2. make it substantial enough for the manly men too! After getting to that time of the week with a vegetable crisper full of some ‘on their way out’ veggies I thought it would be a good excuse to whip up a huge fried rice / nasi goreng. Lucky we also diced and froze portions of delish Christmas ham over the festive season for exactly this. This recipe is very simple and surprisingly quick!! 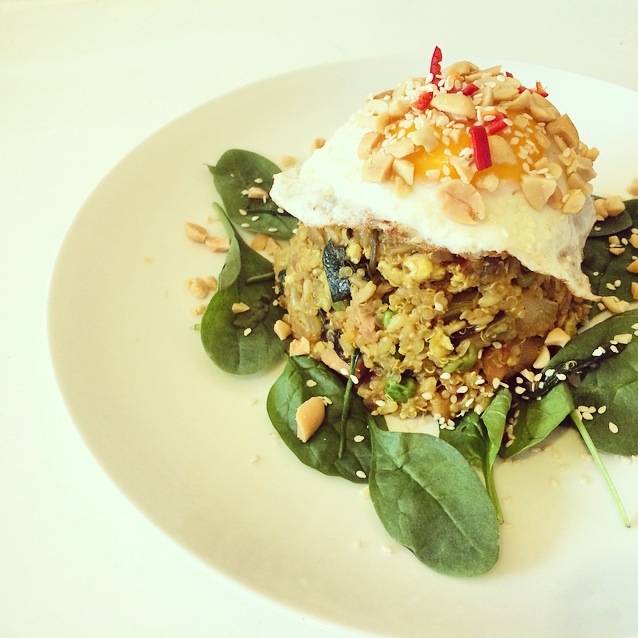 I free-styled with the recipe (standard for me) and added things and tasted as I went and in the end what started as a fried rice – I am now calling the best healthy nasi goreng I have ever had! Four happy and FULL tummies. I used a half half mix of quinoa and brown rice. 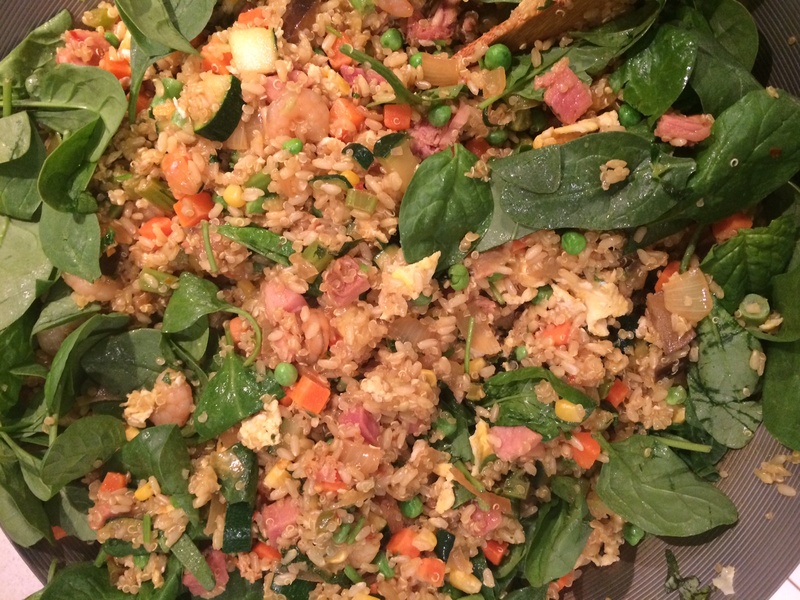 Quinoa is a super high protein grain (which some classify as paleo) and brown rice is just the bomb! When combined you get a really light and fluffy texture which is packed full of fiber, carbohydrates and an abundance of nutrition. In a large wok, fry up onion with the coconut and sesame oils. Add ‘herbs and spices’. Add all of the ‘sauces’. Add diced kale, broccoli, eggplant and zucchini. Turn down the heat to low. Be careful because the wok might stick and burn at the base. 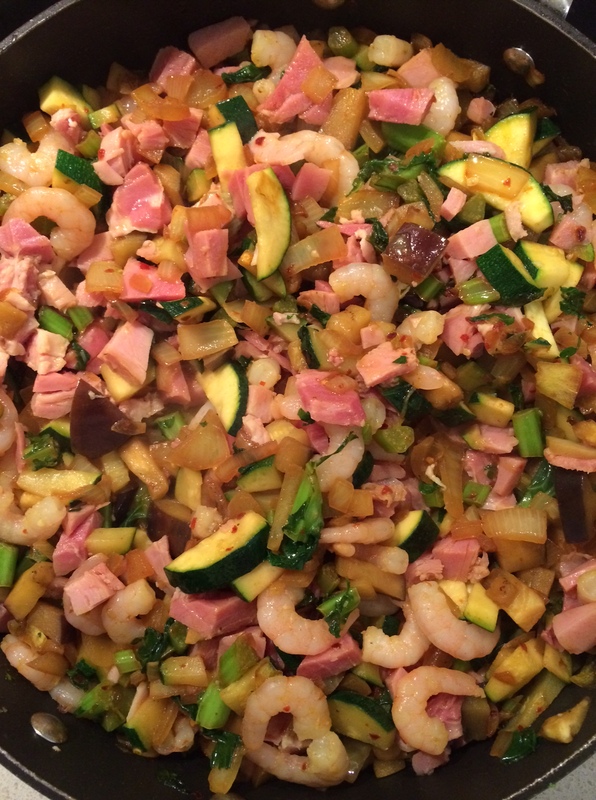 Add COOKED ham and prawns – stir. Slowly add COOKED quinoa and brown rice and toss through evenly on a low heat. Add the spinach leaves and the pea, corn carrot mix. Meanwhile fry up 4 eggs in a greased fry pan. To serve – pick a deep round mug/bowl or ramekin. Spray with oil to avoid sticking. 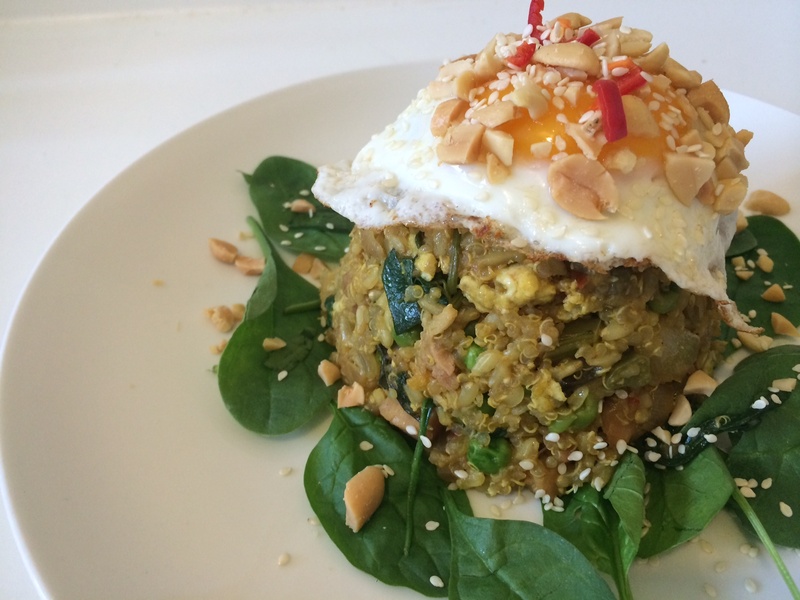 Spoon and pack the nasi goreng into the bowl and turn upside down onto a plate with a few stray spinach leaves. Do this for all 4 serves. 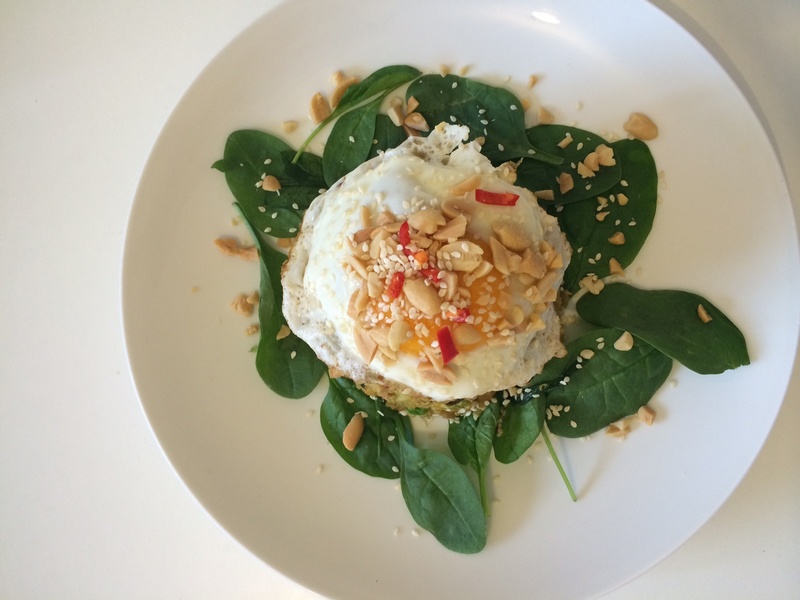 Lay runny fried egg on top and garnish with a dollop of sweet chili, some fresh chili (if you are game), some coriander, crushed peanuts and sesame seeds. and serve!!! You can omit the chili all together when serving for children or the spice sensitive. Otherwise it is a great easy quick meal which should satisfy all! I am obsessed with this recipe thank you!! !